We had always wanted to turn the grassy patch behind the parking lot into a kitchen garden. I say we in a very casual way, because E! is the brains behind this operation, and those ideas are all hers. Anyhow, the idea of the kitchen garden is partly for marketing, but also to partially supply the restaurant with herbs, which are quite expensive, and various vegetables and berries, if they grow. 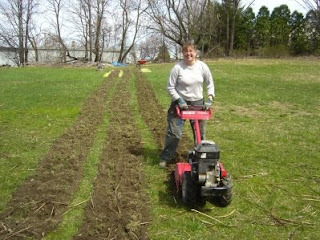 By the end of the day, she had tilled half the field over twice. 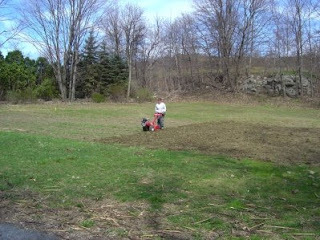 we decided to only do half the grassy patch, which will be plenty of work.